Click here to access our online eBooks! This will allow you to login to our ebooks and start reading!!! Blanche R. Solomon Memorial Library is proud to offer you the best-selling and classic eBooks, audiobooks, music, and video available 24/7 from the library's digital collection, on the Camellia Net Overdrive website. You can browse the collection, borrow with your library card, and enjoy on your computer, tablet, smartphone or eReader device. 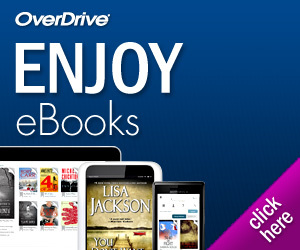 Most borrowed eBooks can be enjoyed immediately in your web browser with OverDrive Read. Or, you can download eBooks into free software, Adobe® Digital Editions, or send to your Kindle® device or app [U.S. Libraries]. Downloaded eBooks can be transferred to eReader devices such as NOOK®, Sony® Reader™ and many more. Audiobooks, music, and video can be downloaded into OverDrive® Media Console™ (just MP3 audiobooks for Mac® users). Once downloaded, titles can be enjoyed immediately or transferred to a variety of devices, including iPod® and many others. Some audio titles can also be burned to CD to listen on-the-go. Users with smartphones or tablets can install the OverDrive Media Console app to directly download EPUB eBooks and MP3 audiobooks titles to their device. No matter how you plan to enjoy, titles will automatically expire at the end of the lending period. There are no late fees! This new service, powered by OverDrive, is free with your library card. To get started enjoying eBooks, audiobooks and more, visit Camellia Net Overdrive. You can find helpful tools and information, as well as a link to contact support.